Historically, coal and the railroad train enabled much of the industrial revolution. Both came from the underlying innovation of steam engines. Coal was the new wonder fuel, far better than wood though harder to extract, and it made continental scale economies possible. Synergistically, coal drove trains that in turn carried coal, crops and much else. A similar synergy may operate to open the coming interplanetary economy, this time wedding nuclear rockets and robotics. These could operate together, robot teams carried by nuclear rockets to far places, and usually without humans, who would compromise efficiency. Mining and transport have enormously expanded the raw materials available to humanity, and the rocket/robot synergy could do so again. As such fundamentals develop in space, other businesses can arise on this base, including robotic satellite repair/maintenance in high orbits, mining of helium 3 on the moon, and metal mining of asteroids. Finally, perhaps snagging comets for volatiles in the outer solar system will enable human habitats to emerge within hollowed-out asteroids, and on Mars and beyond. Such ideas have been tried out in the imaginative lab of science fiction, exploring how new technologies could work out in a future human context. Here Robert Zubrin describes the engineering and economics of such an era, starting with an appreciation of how far we have come already in modern times. Writing circa 1800, Thomas Malthus said that production rises only arithmetically as population rises exponentially. If this were true, then GDP per capita would collapse as both population and GDP rise, implying a total impoverishment of humanity long before world GDP rose to the level required for starflight. But if we examine historic data, we can see that the theory of Malthus is at complete variance with the facts. We begin with fig. 1, which shows data for world population, global gross domestic product (GDP), and GDP per capita from the year 1500 to the year 2000. Examining Fig. 1. we can see that while human population has certainly increased over time, GDP has increased even more, and the key metric of average human well-being, GDP per capita, has gone up as population has increased, rather than down, as Malthusian theory would predict. Fig. 1. 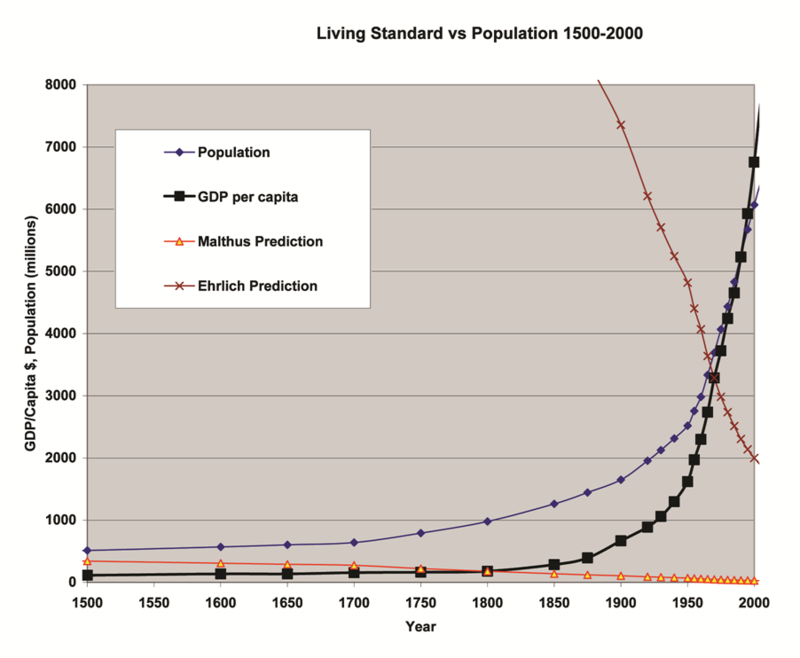 Comparison of Malthusian predictions with reality, 1500 to present. In Fig. 1, the actual per capita GDP is shown by the thick black line marked with squares. We also show with the thin line marked with triangles, the predictions provided by Malthusian theory at the time of Malthus’s writing circa the year 1800. According to Malthus, the sixfold increase in population between his time and the year 2000 should have resulted in a disastrous drop in human living standards. Instead, global per capita GDP actually increased almost forty-fold, from $179 annually in 1800 to $6757 by 2000. In short, Malthus was wrong. Well, everyone has the right to be wrong about predicting the future. But the reader will note that I have taken the liberty of extending Malthus’s prediction into his past. The world population in 1500 comprised 500 million people, just half of that prevailing in Malthus’s day. If living standards go down with increased population, they should go up with decreased population. Thus, according to Malthusian theory, the world should have been much richer in 1500 than it was in 1800, with per capita GDP in the range of $360, instead of the $114 in actually was. Thus Malthus was not just wrong about predicting the future, he was wrong about predicting the past, and not by a small variance, but by a factor of three. Even more absurd were the predictions based on Malthusian theory widely published by Paul Ehrlich, both alone and together with his protégé John Holdren (currently President Obama’s science advisor) as well as the Club of Rome during the 1968-1972 timeframe. Writing circa 1970, all of these groups predicted that the “population explosion” would cause a catastrophic collapse of human well-being by the turn of the century, exactly the opposite of what actually happened. If Ehrlich et al had been right, average world GDP per capita would have fallen from $3200 in 1970 to less than $2000 today. Instead rose to over $8500 by 2010. This fourfold error in predicting the future was really unforgiveable, because Ehrlich et al had the advantage of hindsight in knowing about the wild inaccuracy of Malthus’s original prediction, which by 1970 had already been shown to be off by a factor of fifty (an actual 18-fold increase in GDP per capita instead of a predicted threefold drop.) But even worse, it is evident that Ehrlich, Holdren, and the Club of Rome studiously ignored data readily available to them about the economic history of the recent past. That is, if one takes the trouble of extending their predictive theory backwards in time (as shown by the thin line marked with “x’s” in fig. 1. ), we see that it predicts an average global GDP per capita of over $7300 for the year 1900 instead of the $670 that is was in reality. Now Ehrlich was born in the year 1932 (for which his theory predicts an average GDP of $5700, instead of the $1060 that it really was). If a wealthy world had actually existed in the lesser populated 1930s, he should have been able to witness it himself. Instead, within his own lifetime (by 1970), he had seen the world population double and the global standard of living more than triple at the same time. He didn’t even have to open an almanac to know he was wrong. Instead, the data that disproved his theory was readily available to him by direct observation. The same can be said of Aurelio Peccei and the band at the Club of Rome. They simply ignored the facts. Having dispensed with such charlatans, let us examine the data ourselves, to see where it can lead us in developing a true theory that accurately predicts the relationship between human well being and population size. One of the first things any real scientist would do in trying to discover how one variable within a system changes with respect to another is to graph the first variable against the second and see if a clear relationship emerges. So let’s follow this tried and true standard technique, and graph world population size and per capita GDP but against each other, using the data of the last five hundred years of human history. The results are shown in Fig. 2. Fig. 2. How per Capita GDP has changed as Population has grown, 1500-2010. Well, there certainly seems to be a pattern here, which obviously is not the Malthusian claim that living standards decrease as population grows. Rather, what we see is GDP per capita increasing with population, with the line curving upward for the past two centuries. Since 1800, the world population increased sevenfold, while the global GDP per capita has increased fiftyfold. Put another way, over the past two hundred years, GDP per capita has risen in proportion to population size squared, while the total GDP has risen in proportion to the size of the population cubed. Some of this profound progress may be due to a qualitative change in global communication and transport that made the growth rate of the effective population of world civilization significantly faster during the earlier part of this period than the gross numbers alone would imply. However, if we take the more limited period since 1950 as our relevant sample, we still find GDP per capita increasing in proportion to population to the 1.6 power. “But that makes no sense!” the Malthusians cry. It doesn’t matter. That’s what the data says, and science is about accounting for reality. This entry was posted in Blog, Excerpts and tagged 100 Year Starship, Malthusian Error, Robert Zubrin, space colonization, space mining, space travel by Gregory Benford. Bookmark the permalink. 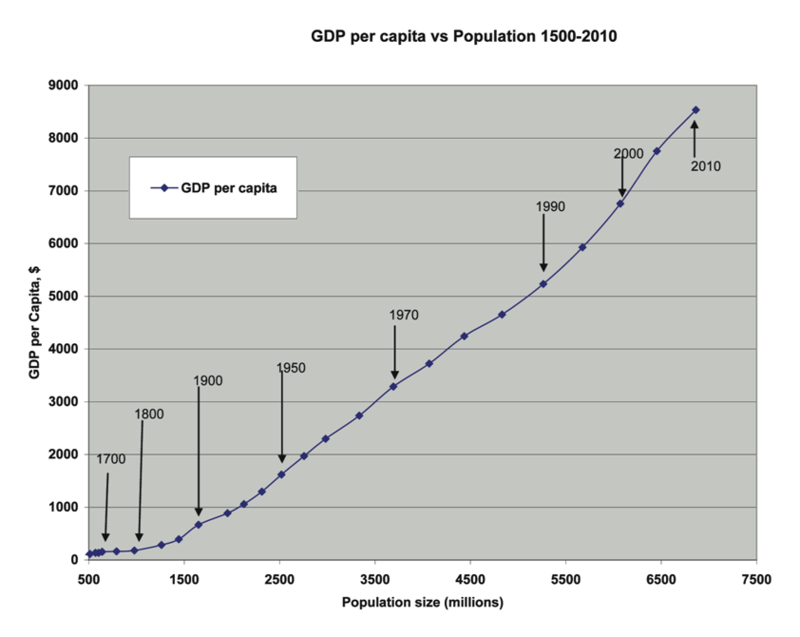 Based on the actual data used for the GDP per capita vs population 1500-2010 chart, does that give us enough information to project what year we may reach sufficient GDP for achieving initial and/or sustained interstellar travel, barring any significant regression of population growth? If so, what happens to that projection when we apply restrictive factors, such as collateral environmental effects and agricultural capacity? Is there a projection of increasing capacity to mitigate these other factors as efficient and less polluting technology and new means of improving agricultural productivity are being developed at an ever increasing pace? A rough calculation using Bob’s data says ~150 years to have enough GDP to build a plausible starship. Unmanned at first, maybe beam-driven sails, but a start at velocities that can finish missions in a century. Allowing these other factors lies beyond plausible projection. Another problem with Mr. Zubrin’s correlation of growth in per capita production with growth in population size is that it ignores the effects of decline in the rate of population growth, a decline that presages a peak global population by mid to late century of 9 to 10 billion souls. If growth in per capita production is tied to growth in overall population then we should (according to Mr. Zubrin’s charts) see a slow-down and stop in overall economic activity well short of the totals needed for humanity to afford interstellar expeditions. Peter Hook, one possibility is that economic activity will rise even as human population declines, thanks to a rising robotic population and a rising “wealthening” of the humans. Whether current economic “technology” is up to such a radical prospect is the task of this century – can we create an economic system that rewards risk and innovation, yet makes everyone richer? In the process we must avoid those time-honoured traditions of cronyism, corruption and sloth. Well said, Peter. My own story in the book is about exactly that. NB: I am unsure how much the AV recording picked up my “objection” from the audience to Zubrin’s starship economics. He stumbled over an often heard fallacy – i.e. starships are Energiser Bunnies that need to be powered up with retail energy. Beam propelled starships might be, but a fusion propelled vehicle isn’t. The energy costs are a smaller fraction, thanks to the energy density of fusion fuels. For example, a deuterium-fusion starship, with the efficiency of Freeman Dyson’s Interstellar Orion, can reach 0.1 c, with a fuel mass equal to ~53.5 times its empty mass. If it uses rockets to slow down – much less with a magnetic-sail, but let’s assume it’s just rockets. For the 1,000 tonne starship that Zubrin proposed, that’s 53,500 tonnes of deuterium fuel. Deuterium costs ~$3000/kg, so the starship would cost ~$160.5 billion to tank up. Almost 1/1000th of what Zubrin claimed. Aerospace machinery costs $0.1 billion per tonne, so the starship would cost ~$260.5 billion in total. Comparable with Apollo – except we don’t currently have a fusion drive as efficient as Dyson’s Orion. 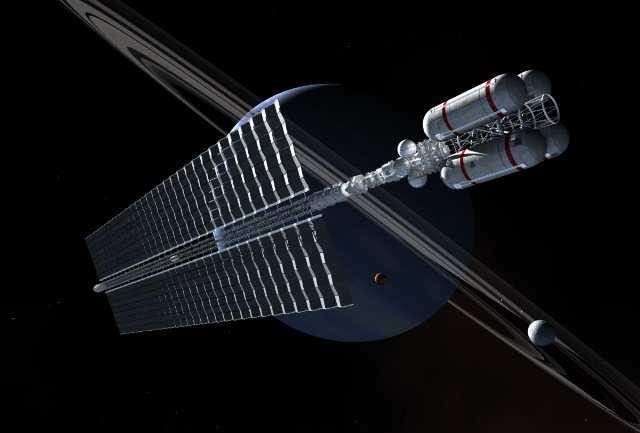 It may well take us the next ~100-150 years to achieve, via incremental engineering along the lines Zubrin described, and by that stage we might have enough experience of living in space for it to succeed too. Both Malthus and Zubrin are half correct and half wrong. I think the population explosion was a real problem that global economic development helped solve. At the same time, Zubrin is correct that more people (usually) translates into more productivity and more customers. However, the Earth is a sphere with finite surface area and a finite amount of resources. Hence, there is a limit to how many people can comfortably live on the Earth, even though that limit is a lot further out than is generally assumed by malthusians such as Earlich. Lets just say that economic development defused the population bomb by allowing more life style options than having lots of kids, and we can all call it a day and go home. There is no need for governments to have explicitly anti-natal or pro-natal policies at all.